This is a commentary on how the political landscape is shaped by our choices as consumers – swipe to vote. A purchase has become as politicized as a trip to the voting booth. Are the market forces of our buying decisions capable of supplanting the powers of democracy? As paid lobby’s influence over politics becomes systemic, and corporations, brands and products become blatantly political, is voting already obsolete, and the swipe of a credit card is how we actually cast our vote? In a political climate as polarized as it has ever been, how far are we from a time when everything we purchase is politically labeled? How long before product labeling and packaging indicates party affiliation? Next to the graphic for Kosher, Organic or Fair Trade there is a symbol designating a product’s political affiliation. How long before consumers demand to know if a purchasing decision is going to support or oppose the issues they stand for? We have pink products for breast cancer awareness. Is it just a matter of time before red and blue packaged products designate party affiliation? Would companies change their politics to court consumers? Are consumers politics influenced by what they want to buy? Does the the political process no longer turn us on because political power is a tool wielded by wealth first and democracy gets the sloppy seconds? 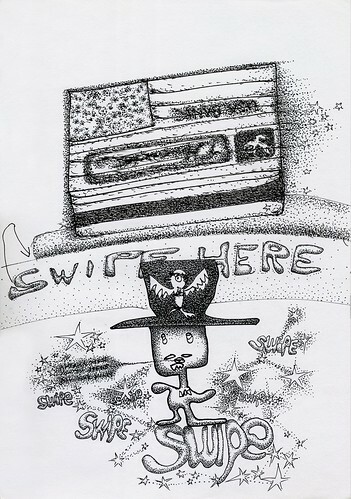 In this dot drawing, Uncle Sam is reduced to a fun promotional character, overshadowed by the venerable credit card, which appears to have become the new American flag. The success of the little mascot seems to have resulted in so much swiping that it has dislodged the stars, leaving small craters. The once bold stripes have trickled down into a single magnetic strip, with the call of our patriotic duty from, die for your country, to buy for your country. Love it. It’s just the logical next step. This is not so far from reality. Just recently, buying fried chicken at a national chain was tied to political support for the anti-gay political stance of the chain’s owner. And the amount of money the PRESIDENT can raise in his re-election effort is tied to his chances of re-election. The supreme court has ruled that money=speech and corporations=people.